Update on Inaugural Eczema Support Group event – A huge success! 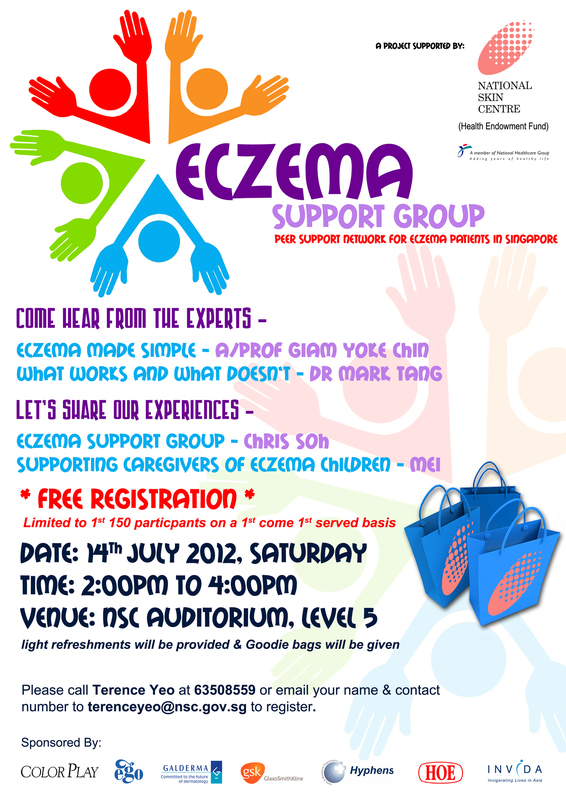 Posted byMei 16 July, 2012 16 July, 2012 Leave a comment on Update on Inaugural Eczema Support Group event – A huge success! A successful Inaugural meeting of the Eczema Support Group! The event was a huge success with the 150-person auditorium packed! This was despite the heavy downpour and the traffic jams along various expressways! And NSC staff were excellent – so many volunteered their Saturday, and all of them are earnest and positive! Hurray! Some notes that I took, based on talks by doctors – Prof Giam and Dr Mark Tang. – Usually starts with lower filaggrin gene, followed by exposure to environmental factors, allergen sensitization, staph bacteria colonization and sensitization to proteins. – Also mentioned need to see doctor if infection due to herpes virus, not to self-medicate, see previous post here. What Dr Tang conveyed was the thought process and general guidelines that eczema patients can use to determine if they ought to explore another treatment. – Question on differentiating heat rash from eczema – child’s sweat glands not fully developed, thus easier to have heat rash. Need to be confirmed by doctor. – Phototherapy – for adults, cos need to stand in a box, wear goggles, thus more suitable for adults and teens; a specific spectrum of UV rays that is studied to reduce inflammation is shined onto the patient during therapy. p.s. this blog post, as all blog posts, are written by me and not subject to vetting by any doctor. So there’s a chance I may not be 100% accurate in my note-taking, well, to be very sure you heard right, you’ve to attend the next event yourself!